The Program for International Student Assessment (PISA) is an international assessment that measures 15-year-old students' reading, mathematics, and science literacy. PISA is coordinated by the Organization for Economic Cooperation and Development (OECD), an intergovernmental organization of industrialized countries. India has participated in the global assessment only once in 2009. Results were shocking, we were among the bottom of the list of 74 countries and regions, finishing just above Kyrgyzstan. So why are we still not doing anything about it? Why are we hiding and giving excuses? The Indian HRD ministry was so embarrassed by the PISA 2009 result that it kept rabbiting on its linguistic-cultural-discrepancy argument to stay out of PISA. The ‘language issue’ has now become an official excuse. India’s PISA fear: The average IQ of young Indians in India is 82, according to Psychometric expert Richard Lynn. It is quite low than the average IQ of Chinese in China, which is thought to be in the 101-102 range. India prides in being the country of talented individuals, but this result shows that our school kids cannot match the global level of evaluation. The then government thought rather naively that more money and more standard schools would fill the intellect deficit. Unfortunately, no one has an answer on the question of why a third of the children from the land of Srinivasa Ramanujam, one of the greatest mathematical minds of modern times, had cold sweat when asked to find a fraction larger than 2/7. 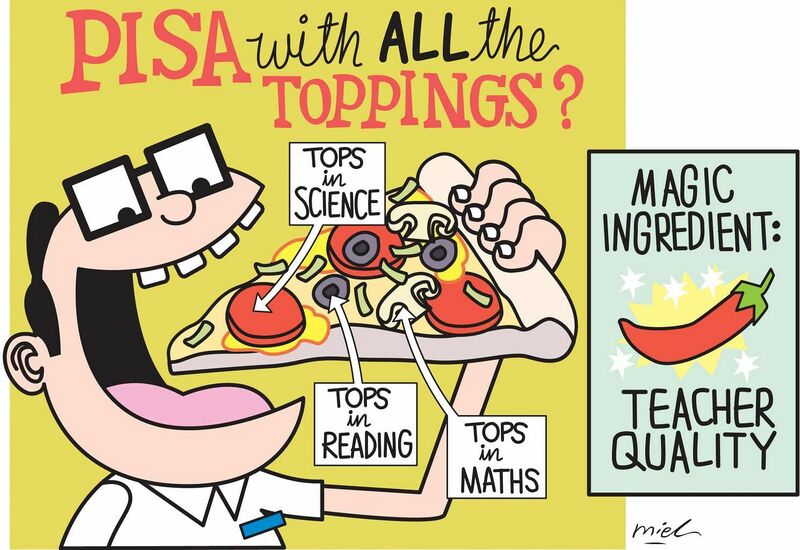 What can Indian schools do to be, if not top, at least an average scorer at PISA? There is a multiplier of average IQ, the Flynn effect. The Flynn effect is the substantial and long-sustained increase in both fluid and crystallized intelligence test scores measured in many parts of the world from roughly 1930 to the present day. It makes IQ rise with the pushes of civilisation, improvement in diet, better living conditions and genetic changes. We can use it to our benefit. We can visit and observe the education practices of top scorer countries, like Finland, and apply them in our system. What is special about the top scoring countries that Indian schools lack? Finland has consistently been the top scorer of PISA. Their specialty? The quality of Teachers. Their approach is simple; good students come from good teachers, and good students mean the country’s future is in better hands. Teaching career is the number one choice in Finland. All those who want to become a teacher have to go through a rigorous admission process. They have designed their teacher education system in such a way that will get the best from young individuals who have a natural passion to teach for life. Student teachers are trained in theory and practice. The course is of 6 years, in the end students leave with a Master’s degree in Teaching. Read more about Finland’s Teacher training system here. If we go by the Flynn Effect, India’s average IQ may move in the 90s range by 2030. But by then China would have reached much higher levels. Rather than going into defensive, we need to start working on improving our education system. The sooner, the better. Experience the world’s best Teacher Training practices of Finland, which is consistently among the top scorers of PISA. Register in our Study Tour to Finland 2017 today! For more information, click here. This article contains excerpts from ‘The Quint’. You can read the original article here.